The Weinstein Company is developing a film about The Catcher in the Rye author JD Salinger. The tale of adolescent alienation is considered to be one of the most influential American novels of the modern era. The film will be written by Shane Salerno, whose documentary Salinger opened this month to mixed reviews. The biopic will focus on the writer's life, from serving in World War II to the publication of Catcher in 1951. It will examine "the effects war can have on an artist". Salerno spent years researching the reclusive author for his recently released documentary, which has also been produced by the Weinstein Company. It delves into the life of the famously reclusive author, who died in 2010 at age 91. Bruce Handy in Vanity Fair cited its "breathless, overheated style", concluding: "A documentary about Salinger should make you want to go out and re-read all of his work. This one makes you never want to think about him ever again." "Salinger would have surely been horrified to see his personal life posthumously excavated to such a degree, and the filmmakers never really make a compelling argument that it should be," writes Andrew Barker, in industry paper Variety. Salerno has also co-authored a biography of the author, which debuted at number six on The New York Times bestseller list this week. "Shane has created an amazing documentary about one of the most beloved but enigmatic literary figures of our time," said Harvey Weinstein. "The material will make for an incredible live action narrative." The Catcher in the Rye is Salinger's only published novel. He followed it with a collection of short stories and several novellas. He stopped publishing in 1965 and withdrew from public view, but is understood to have continued writing. 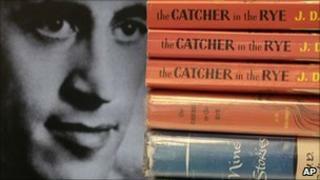 In 2011, a book billed as the sequel to The Catcher in the Rye was banned from release in the US. Swedish author Fredrik Colting claimed his book - which featured a character based on Salinger's anti-hero Holden Caulfield - was a literary commentary and not a sequel. But a US judge blocked its publication in North America, saying it mirrored Salinger's original too closely.